Do you love Pecans? I know I sure do. For as long as I can remember, Pecans have been a favorite in my family. Perhaps it’s because Pecan’s are a southern crop, or maybe they’re a favorite because they taste so good. 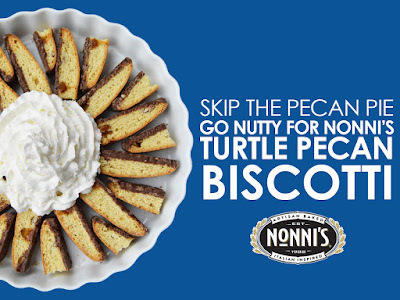 Whatever the reason, I was delighted when I was asked to try the new Turtle Pecan Biscotti’s from Nonni’s. I’ve worked with Nonni’s in the past and loved their biscotti thins, so I happily agreed. I received complimentary products to help facilitate today’s post and giveaway, however all opinions and love of a great pecan dessert are my own. 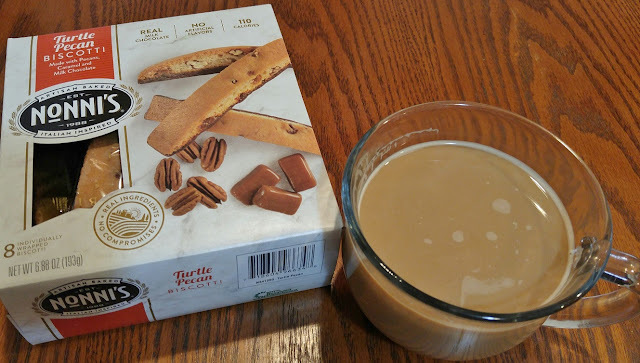 I’ve been trying to eat healthier this year and normally would have to pass on the typical desserts made with Pecans, chocolate, caramel and butter, but I was delighted to learn that each serving of Nonni’s Turtle Pecan Biscotti has just 110 calories. These delightful tasting treats are perfect alone or with your morning coffee. My daughters enjoy them after school alone or with tea. Even my husband, who isn’t a big sweets eater, raved about the taste and texture of these biscotti’s! They are simply too good to resist, so I’m thankful the box only comes with 8 servings, or I’d be in trouble. If you love dessert and Pecans- you've got to try these! If you need an excuse for dessert, why not go nutty and National Pecan Day on April 14 with America’s classic, heart-healthy hickory nut? 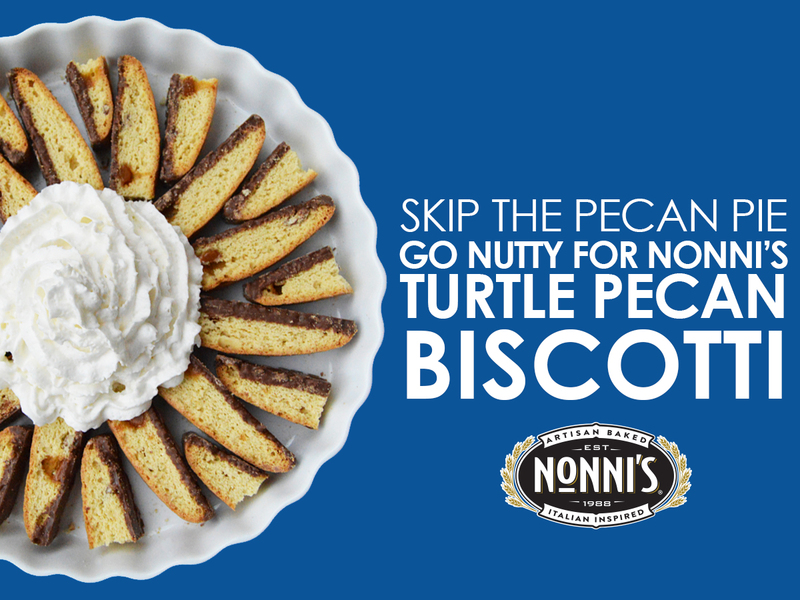 Skip the Pecan pie and try Nonni’s Turtle Pecan Biscotti instead! I invite you to learn more about Nonni’s by visiting their website and following them on Facebook and Twitter. Thanks to our sponsor, Nonni’s, one lucky reader will win a box of Turtle Pecan Biscotti’s to enjoy right away and 2 free coupons to pick up more boxes later. No purchase is necessary to enter using the Rafflecopter from below. My WAHM Plan is not responsible for prize fulfillment. I will mail a coupon to each winner. Winners will be notified by email used on entry form and have 24 hours to respond or another winner will be chosen. This giveaway is not associated with nor endorsed by Facebook, Twitter, or any other social channel. Please share in comments: What is your favorite Pecan dessert/dish and when do you serve it? I love Pecan Pie, and serve it every year at Thanksgiving. Pecan pies are the best Susan! I love having a nice slice on Thanksgiving as well! I love pecan pie and I serve it every year at Thanksgiving. I also LOVE turtles! I bet these biscottis taste wonderful! I love Turtle Brownies. I make them quite a few times per year, usually birthdays, because they seem to make people happy. My favorite pecan dish that I make is pumpkin pecan cheesecake! I make it every fall, usually around halloween and for Thanksgiving. It's so yummy and you can find tons of recipes for it online, I like to change it up a lot every year! I like cinnamon pecans. I make them during Christmas. I love putting pecans in my trail mix! Pecan pie of course, great at family gatherings. 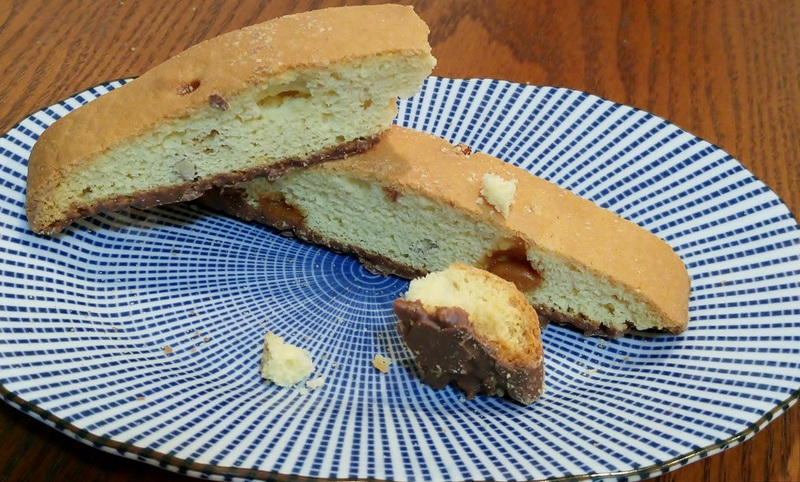 I've never had a biscotti, it looks good.Would love to try. I,ve never had Biscotti. It looks very good. I love pecan pie and eat it on holidays and days I really want it just for fun. I'd like to win this as a suprise for my husband, I don't eat this kind of desert. My favorite is pecan pie. We had a pecan tree in our yard growing up, so pecan pie was a frequent dessert. My favorite Pecan dessert is this pumpkin pecan rollup with cream cheese frosting its delish, I make it around thanksgiving usually.